Bank of America's shares are down by double digits this year despite the bank's ongoing and undeniable improvement. Bank of America's (NYSE:BAC) stock isn't for everyone, but if you want a value play in the banking sector, then it may be the one for you. I say that for four reasons. First, shares of Bank of America are near their 52-week low. The stock's average price in 2015 was $16.58. Today, shares trade for just over $12 a share; that equates to a 28% discount. 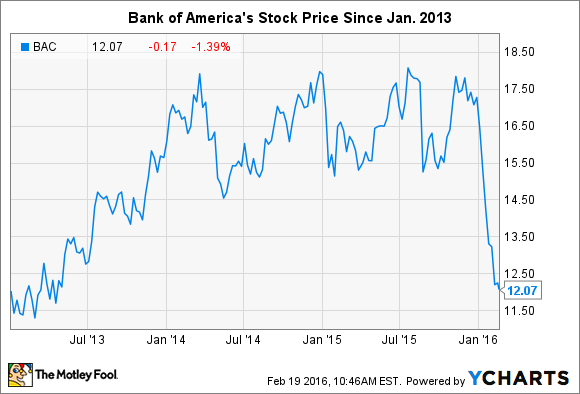 You'd have to go all the way back to 2013 to pick up Bank of America's shares for the same price they cost today. Since then -- and this is the second reason you might want to consider picking up stock in the nation's second biggest bank by assets -- its earnings have improved demonstrably. Last year was the first time in nearly a decade that Bank of America reported four consecutive calendar quarters of respectable profitability. It earned an average of just under $4 billion a quarter in 2015. That's a far cry from the $7.1 billion in quarterly net income it would earn if it matched Wells Fargo's profitability, but what matters is that Bank of America is going in the right direction. Its progress in this regard (this is the third reason that investors may want to consider adding Bank of America stock to their portfolio) will make it much more likely that the $2.1 trillion bank will increase its dividend this year (though I think it should favor buybacks). This is contingent on the Federal Reserve's approval in the 2016 comprehensive capital analysis and review process, the results of which are due in June. Bank of America has struggled in the past to prove to the Fed that it has a big enough capital buffer, and/or that its capital-planning process is sufficiently sophisticated, to ensure it wouldn't need another bailout in the event of a future severe economic downturn. This has prevented it from raising its dividend in all but one year since the crisis. But this year should be different. Thanks in large part to its improved earnings, Bank of America has an abundance of capital on its balance sheet. It held $163 billion in Tier 1 common capital at the end of 2015. That was $23 billion above the minimum threshold to be considered a well-capitalized bank. In addition, I don't think it's unreasonable to assume Bank of America has learned its lesson when it comes to passing the stress tests and the associated CCAR. While the Fed didn't reject the bank's capital plan last year, it required Bank of America to resubmit its proposal due to "deficiencies" in its capital-planning process. This seemingly led to the resignation of the bank's CFO. Given this, I think investors can rest assured that Bank of America will proceed with an abundance of caution this year with respect to the due diligence of its submission. This isn't to say it won't run into problems again, because it could based, on its track record, but I'd be surprised if a presumed request by the bank to distribute more capital to shareholders will be denied. Last but not least, Bank of America's shares are cheap. Trading for just over half of book value, they fit the age-old maxim to "buy at half of book value and sell at two times book." Aside from Citigroup, it's the cheapest big bank stock by a long shot. Shares of Wells Fargo, by comparison, trade for a 40% premium to book value. Thus, to repeat, while Bank of America's shares aren't for everyone, if you're looking for a value play in the banking sector, I don't think you can do better.